The rapid increase in spending on prescription drugs has been widely recognized, prompting calls for government intervention. But little is understood about how much the various players in the pharmaceutical distribution chain are making. 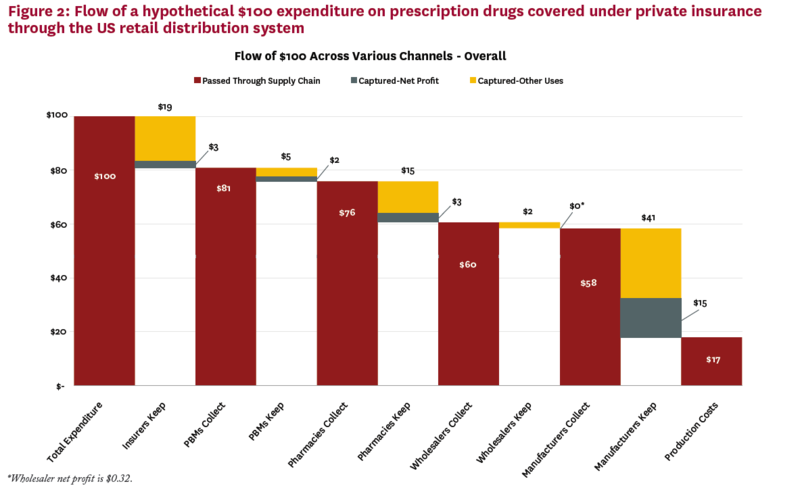 A new report published by the USC Schaeffer Center for Health Policy & Economics analyzes the allocations across the major stakeholders- from the pharmacy where the prescription is filled to the production of the drug at the manufacturer- to better understand the economics of the distribution system and illuminate potential opportunities to reduce total drug spending. The study, co-authored by Neeraj Sood, Tiffany Shih, Karen Van Nuys, and Dana Goldman, found that for every $100 spent on retail prescription drugs in the US, the manufacturer received $58, of which about $17 goes direct production costs. The remaining $41 accrues to intermediaries in the pharmaceutical distribution chain. 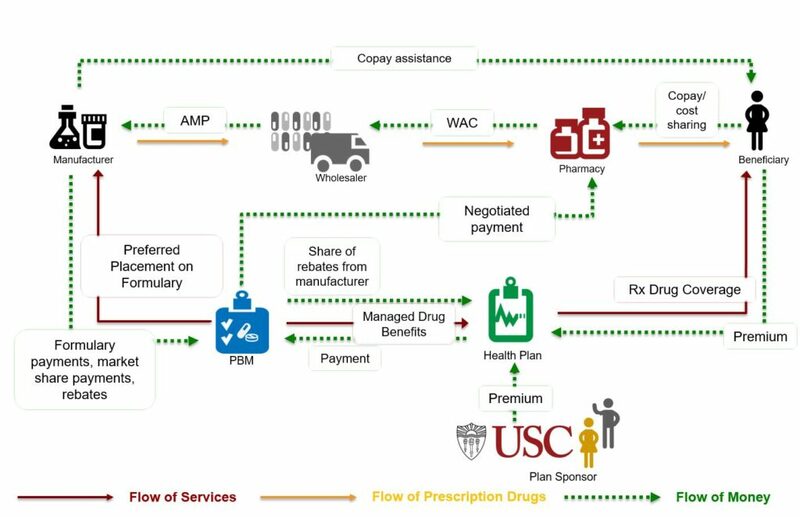 The researchers developed a conceptual framework of the flow of prescription drugs, services, and dollars between the insured patient, retail pharmacy, health plan, pharmacy benefit manager (PBM), drug wholesaler, and manufacturer. They then collected gross and net profit data from the 2015 US Securities and Exchange Commission regulatory filings of the largest publicly traded companies in the pharmaceutical distribution system. The objective was to estimate average gross and net profit margins for each sector in the distribution system and use these data to calculate the proportion of the aggregate flow of funds captured by each sector. To illustrate the implications of their framework, the researchers explored a hypothetical scenario in which $100 is spent on prescription drugs acquired at a retail pharmacy using commercial insurance. Of a $100 expenditure on pharmaceuticals by consumers (composed of both out-of-pocket and insurer payment), roughly $17 goes to drug production costs, $41 accrues to the manufacturers (a third of which is net profit), and $19 accrues to insurers ($3 of which is net profit). PBMs keep about $5 ($2 net profit), pharmacies keep $15 ($3 net profit), and wholesalers keep about $2 (32 cents net profit). Total net profit on a $100 expenditure is $23, of which $15 is captured by manufacturers and the remaining $8 by intermediaries. The study also points to important differences in how funds accrue across the system between branded and generic drugs. While manufacturers make about three times the gross profits on branded vs. generic drugs ($58 vs. $18, consistent with the market exclusivity granted to patented drugs), other segments make much more on generic expenditures: PBMs make four times as much on generic drugs compared to brands, while wholesalers make eleven times as much, and pharmacies almost twelve times as much, $32 compared to $3. All in all, the researchers find that more than $1 in every $5 in spending on prescription drugs goes towards profits of firms in the pharmaceutical distribution system. Moving forward, greater scrutiny of pricing policies and more competition throughout the distribution system is warranted, they write.